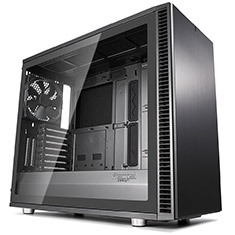 The Define S2 is the latest leap forward in open-layout case design—an ingenious refinement of the zero-obstruction formula that cemented the series as the de facto standard for the silent high-performance build. The S2 achieves increased airflow and water cooling capacity with nine total fan positions and 15% larger intake area vs. the previous generation. Radiators up to 420 mm install directly through the top by way of an innovative removable bracket with built-in fill port for easy access, and there’s room for radiators up to 360 mm in the front and 280 mm in the base. Pumps and reservoirs are supported right out of the box with integrated mounting locations and adjustable brackets. Full USB 3.1 Gen 2 Type-C comes standard along with three Dynamic X2 fans, full length ventilated PSU shroud with alternate SSD mounts, and support for vertical GPU installation via the Flex VRC-25 riser, available separately. Bolt-free tempered glass offers an exceptionally clear interior view thanks to an elegant push-to-lock latching mechanism, and Third generation ModuVent technology complements a generous application of industrial sound dampening to ensure your hardware is seen but not heard. Whether your aim is silence, efficiency or sheer water-cooled extravagance, the Define S2 hits the mark.